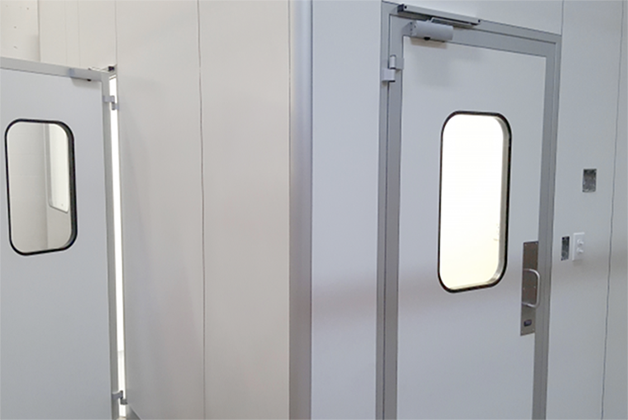 All of our CLEAN3 Systems offer several Cleanroom Doors including: Single or Double Swing-out, Roll-up, or Sliding. Similar to our wall systems, our swing-out doors consist of two layers of high pressure laminate (with a sealed, insulated interior). Swing-out doors fit flush with both sides of the wall panels and are available in several sizes. Further, the internal frame work is constructed of welded extruded aluminum profiles; whereas, the external frames are manufactured with rounded anodized aluminum profiles. All fasteners for the hinges and latches recess into the door frame. Standard hinges allow doors to swing 180° degrees. In addition, our door frames feature dual seal technology. We offer two grades of roll-up doors in a variety of sizes for any application. Our most popular model is the Super Clean unit, which is suitable for use in ISO 7 and 8. The super clean roll-up doors include a curtain which consists of a polyester resistant fabric with a PVC face covering. Thus, it can easily roll up with the material’s high flexural strength and excellent seal. The lower edge of the curtain consists of a stainless steel folded plate, designed for excellent floor sealing performance. The fabric guides hold the gear-box and the rolling drum (AISI 304 SS) concealed in the door frame. All materials are resistant to standard cleaning and sanitizing agents. Alternately, we offer a lower cost roll-up door option called the Clean Roll Door supplied with a galvanized-painted frame for non-classified space. Further, the door frame holds the gear-box and the rolling drum, and conceals the stainless steel curtain guides. In addition, the door frame consists of three metal removable covers enabling easy inspection. Also, photocells (concealed in the door frame) act as a safety feature, preventing contact between obstacles in the door pathway or curtain. All our doors are in compliance with cGMP standards and FDA requirements. Based on the level of the finish and the selection of the materials, the door can be classified according to ISO 14644 for Class 7 or Class 8 clean rooms.